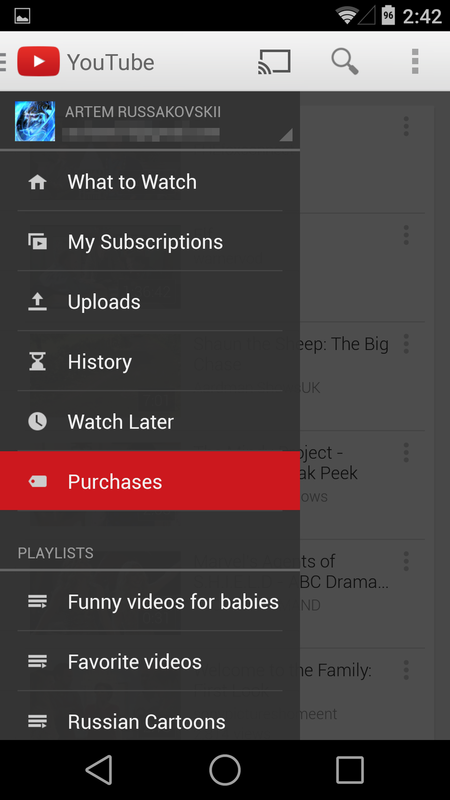 A small change on Google's end has added the option to access your purchased Google Play video content in YouTube. Check out the navigation menu in the YouTube app and the purchases link will now be overflowing with Google Play Movies and TV. Well, maybe not overflowing, but we've all got that free copy of Big, right? The list appears to be chronological and doesn't have any sorting options. You can play any of your videos through the YouTube app, but the Play Movies app still works too. If you use that app, you can at least split things up by movies and TV, and the playback interface is also a little more suited to longer content. This doesn't signal a big shift for Google Play, though. If you've ever watched streaming video from Play Movies on a computer, you can tell it's coming to you via a YouTube frame. It's nice to have options, I suppose.